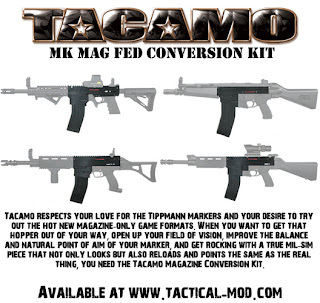 Grey Ops, in collaboration with the TACAMO Canadian distributor Tactical-Mod is very excited to bring you a giveaway I'm sure a lot of you have been hankering for, the TACAMO conversion kit! I've been having a lot of fun with my kit, and I'm sure you will too. Comment on this post (in the form below) saying, "Tactical-Mod rocks!" The winner will be chosen at random using a random number generator (random.org), and contacted via the email address they used to comment (so use a valid email address that you check often). Contest is over 9:59:59 PM (UTC-05:00) Febuary 21,2011. The winner will receive a pre-order (through Tactical-Mod) of one (1) TACAMO Conversion Kit of their choice, which they will receive upon official release of the kits. Keep the comments only to entries please, anything else will be deleted. Contest only open to those living in Canada and the continental United States. As has been previously stated on the blog, all entrants are encouraged to post a photo of their gear (or if they don't have gear, a photo of gear they wish to have) on the forum. As an alternative, please post a photo of the gear you receive via Grey Ops on the forum for everyone to see! Sharing is caring.